Ellis-Browne expressed this view as she delivered remarks at the annual Joseph Chatoyer Wreath Laying Ceremony held at the Obelisk, at Dorsetshire Hill, on Monday, March 14. Ellis-Browne told the gathering that it is her hope that Vincentians can discover closer and direct links to persons of Kalinago ancestry. She disclosed that in recent months, the Garifuna Heritage Foundation has been working closely with the International Indigenous Peopleâs Movement to help in preserving the rich heritage of the Garifuna. Ellis-Browne noted that the Declaration of Indigenous Peopleâs Rights, which was signed by the United Nations in 2007, and to which this country is a signatory, should be implemented in all countries in the Caribbean including St Vincent and the Grenadines. âFor this, one of our specific tasks this year is to ensure that the International Declaration of Rights of Indigenous People be widely disseminated,â Ellis-Browne said. 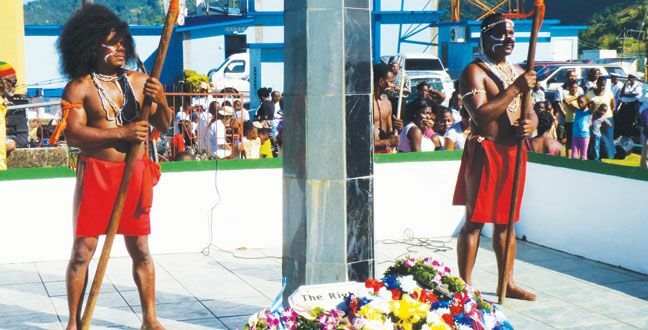 Stating that the small island of Balliceaux remains a sacred land for the Garifuna people, Ellis-Browne said she would like to see some action taken this year to have Balliceaux secured for the remembrance of the Garifuna people who died there in 1797. Paramount Chief Joseph Chatoyer, who died on March 14, 1795 was declared a National Hero in 2002. In his address, Minister of Culture, Frederick Agustus Stephenson said that his ministry is committed to ensuring that the general public is engaged in reflecting on nation building. âOur objective for this month of activities is to further enhance the sense of national pride in citizens; to reflect on their national heritage and to pay tribute to persons whose contributions to society, past and present, improved Vincentian lives,â Stephenson noted. Additionally, Stephenson said, Vincentians should use National Heroes Day as a day to remember the fact that the successes of each generation are built on the achievement of the generation that came before. The ceremony also heard remarks from Health Minister, Cecil Mckie.